It is the Friday after New Year’s and the last thing most people are thinking about is Champagne. After all, you got your fill on New Year’s Eve, right? We had bubbles on New Year’s Eve and on New Year’s morning with breakfast celebrating the fact that we did not have hangovers from New Year’s Eve to which you may well say “Well then, you’re doin’ it wrong.” The best wine of New Year’s Eve was a magnum of 1988 Schramsberg Blanc de Noirs which had been disgorged back in 1999 for the Millennium celebration and (obviously) had be kept properly. It was spectacular; developed and rich and quite Champagne-like. New Year’s morning breakfast brought a bottle of Veuve Clicquot Yellow Label Brut NV that tasted as good as any bottle of Clicquot Yellow Label I have ever had. Now the holiday is fading and … but wait, it’s Champagne Friday. 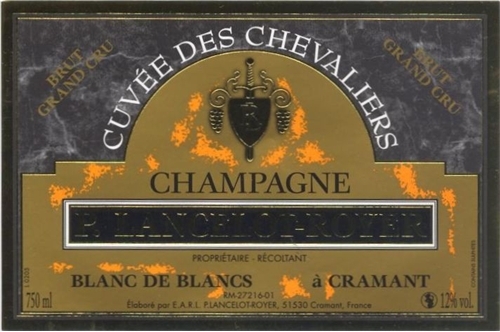 So for that, we have LANCELOT ROYER Cuvee des Chevaliers Brut Blanc de Blancs Grand Cru, Champagne, NV. The producer – Lancelot Royer – is an estate bottler (récoltant manipulant) in the Grand Cru village of Cramant in the Cote de Blancs which is the best part of Champagne for Chardonnay and so this wine is a Blanc de Blancs (white wine from white grapes) which means it 100% Chardonnay. Lancelot Royer is a great believer in long-kept, fractionally-blended reserve wines aged in ancient German ovals – and it shows in the richness of his cuvees. This entry was posted in Bubbly, Champagne, Champagne Friday and tagged Blanc de Blancs, Brut, Cramant, Grand Cru, Lancelot Royer. Bookmark the permalink.